After so much color and boldly patterned dresses, coats and shoes in recent Prada displays, I was surprised by the neutrality of the windows at the Prince Street store in SoHo when I passed by on Friday. All of these paler tones reminded me I have a lovely cream-colored wool coat I need to wear more often this winter. Of course, then I think about getting on the New York City subway wearing said coat and cringe at the idea of what it will come into contact with. Are you a fan of winter white? I like this window...and lately I seem to be drawn to wearing neutrals more and more...even though my post today is super out there color. I love it when you show us NYC windows!! I do like winter white...very much. But I don't own any except an itchy cable knit sweater that I rarely wear. I have considered a winter white coat - perhaps a pea coat - but worry that it will get soiled faster than I can say "why did I buy this coat in winter white?" 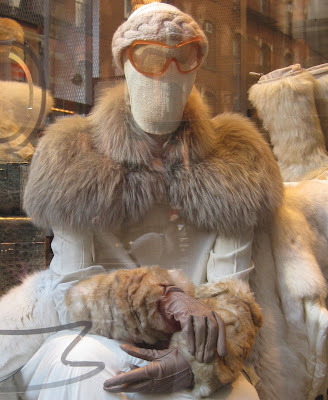 I am a fan of white and cream actually and I am eyeing a white coat with furry sleeves though that is very Snow Queen. But like you, I think of the London Underground and of the state it left previous white clothing I've been silly enough to wear on it! Not really, I always think of hot summer in white. Gorgeous pics, my dear Jill. Always such a pleasure each and everyone of your posts. Winterwhite is popular in posh skiing regions. You would rarely sight it in Vienna. Love winter white but I'd have it filthy in a NY minute. I'm already starved for color as fall descends..--all the stores with their greys and blacks..ugh.